Gaziantep’s Mayor Fatma Sahin has been a role model for developing policies that ensure integration remains a defining characteristic of the local environment. She was elected the first female mayor of Gaziantep in 2014 and, before that, the first female Member of Parliament from Gaziantep, and the first Minister of Family and Social Policy. Recognizing the tremendous needs of the Syrian refugee community, Sahin and the Gaziantep Municipality initiated many programmes addressing issues such as social cohesion, employment, education, housing, health and municipal services for refugees and migrants. The municipality opened the first school for Syrian students in Turkey in 2012, and in 2015 became the first municipality in the country to have its own Directorate of Migration Affairs. IOM Turkey has been a close partner of the Municipality, helping it to implement the projects that make these policies a reality. The municipality has provided over 50,000 Syrians with free medical care, organized Turkish language and education classes for over 10,000 minors, and established industrial zones close to the border in which public-private ventures can employ Syrians. IOM joined these efforts, and works to create livelihoods opportunities for refugees and migrants, meet medical, housing, and transportation needs, and helps draw Syrians and local Turkish host communities closer together through community centres which run a variety of activities and events. 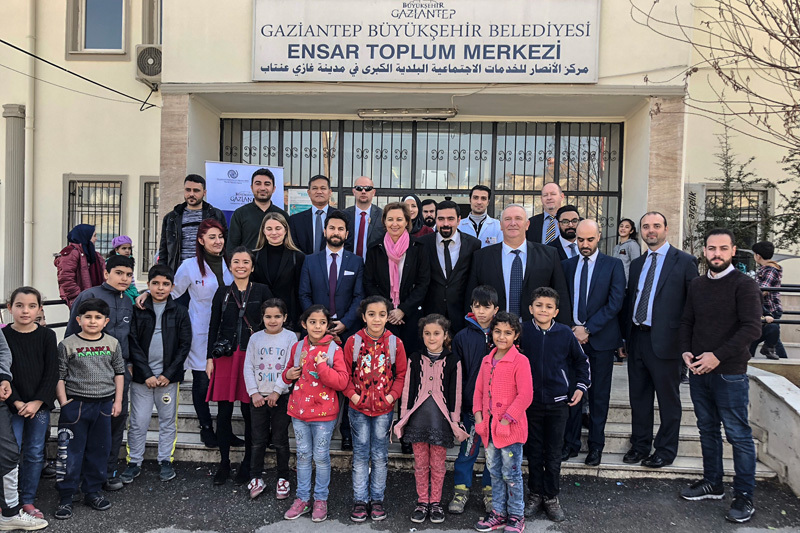 After her meeting with the Mayor, Ambassador Thompson visited Gaziantep Metropolitan Municipality’s Ensar Community Centre which IOM has been supporting with funding from the Japanese Government since mid-2017. Ambassador Thompson met with young people and women of all ages engaged in a range of activities from mosaic-making to painting, cooking and sports (taekwondo, handball, basketball). As the conflict in Syria continues to displace civilians every day, Gaziantep remains an active host city. It also continues to be a crucial lifeline for humanitarian relief for civilians inside Syria, with agencies such as IOM running humanitarian operations from Gaziantep.